Feature image option was only introduced in WordPress version 3.0 replacing post thumbnails of version 2.9. Now, if you are like me who have a number of blogs set up prior to the introduction of the feature image option, what should you do? Are you going to rake through your 1000 or more posts to manually (and painstakingly) add in an image to each of your posts? Also, after you upload the feature image for each post, the image would stubbornly want to appear right on top of the post. What if you don’t want the feature image to appear on top of the post? Then you would need to google around to search for tutorials on how not to display the feature image, which means you would need to add custom CSS, adding scripts that you have no idea what it is for. The Thesis theme is able to auto extract images in your blog posts to be a feature image. So you need not go through the painful process of going back to every single blog posts that you have written to manual load and define the feature image. Note: It is out of the scope of this tutorial on how to ensure certain images is not being displayed. Also, if you are using thumbnails to display related post, removing the WordPress feature post portion may cause your thumbnails not to display correctly. Note: By turning off the WordPress Featured Image option, the box will no longer appear in your Add New Post/Edit New Post function. So in case you need the featured image option, you know where to go back to enable it. Then close the box and click on the green “Save Display Options”. Now, I am only relying on Thesis to grab and display the correct image for me. The minimum image size is 200 x 200 pixels. If you try to use an image smaller than this you will see an error in the Sharing Debugger. So if the image size in the blog post is less than 200×200, it will not be displayed. Probably a truncated image of your header will be grabbed instead. The post had a single image on it. I have never set the image as my featured image in the Edit Post function. If I do not use the upgraded version of Thesis, a truncated version of my site banner is being displayed and it is very ugly. 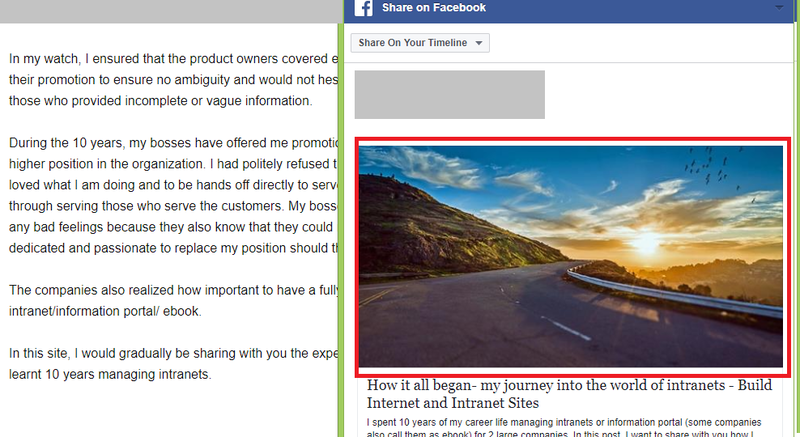 What you see above is the post and the image is displayed at the share button and after it gets posted to Facebook. But the correct feature image is still not displaying. Instead it used the image from my banner! Yikes, I have it happened to me many times before. If the particular post that is being shared does not have an image or the image does not meet the guidelines, then you get a possibly awful looking truncated version of your blog header. This is not unique to Thesis users but to many site developers/owners/bloggers who try to seek out answers in the forums. I have tried all sorts of ways….downloading the “Default featured image” plugin and assigning a default featured image should the post have no feature image. Initially, after I install, activated the plugin and assigned a default image to it, the default image appeared on every page of my site. Every. Single. Page ?. In a separate post in future, I would write about how I managed to get the problem solved using my Thesis template (total lifesaver) as I would need time to come out with the screenshots.